Our historic bed and breakfast situated on The Green in idyllic Chester, Vermont provides a peaceful escape near Okemo Mountain. Although built in 1851, this romantic, Victorian inn is luxuriously appointed with modern day conveniences. 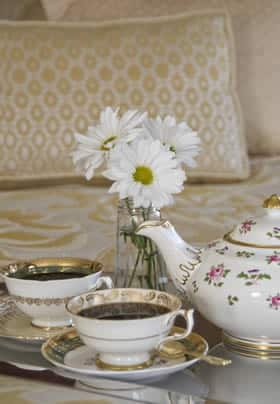 Accommodations at the B&B consist of nine rooms or suites all featuring air conditioning, carefully appointed antique furniture of the period, flat-screen TVs with high speed fiber optic cable, DVD players for our extensive movie library, and iPhone sound & clock systems. Complimentary Wi-Fi Internet is of high enough quality to conduct business. Each room has its own private bath; each appointed with amenities for your comfort including premier 1800 count linens, plush Turkish towels, and robes. Luxurious baths include Jacuzzi tubs, claw-foot tubs for two, showers for two and an outdoor hot tub. After a peaceful night’s sleep, you will be treated to a delicious gourmet breakfast served in our elegant dining room. Breakfast and all baked goods are personally made daily by Penny. We take care to ensure your dietary needs are honored. When asked we will gladly adapt our cooking style for your special needs; vegetarian, gluten free, low / no sugar, paleo, Kosher, vegan. Whether you are planning a romantic weekend getaway or a family vacation filled with outdoor activities, we invite you to come experience the award-winning Old World charm and hospitality that is truly an Exceptional Experience at Inn Victoria. Be sure to check out our current packages too! SNOW!…and lots of it to ski, snowshoe and sleigh-ride! HotelsCombined has rated Inn Victoria as one of the top 3% in the world!!! !